Big Day for My Little Blog and Progress! | Middle-Aged Woman (newly) On The Run! Big Day for My Little Blog and Progress! The First Thing was a comment I got right here on this little blog from one of my running mentors/friends/blogging heroes Terri Lee, author of Run. Dog. Cat. Me. Check her out. She’s smart, funny, determined, and one of those people who gives freely from the benefit of her experiences not just as a runner, but as a person. Anyway, her comment was “GIRL! YOU HAVE BEEN NOMINATED KREATIV BLOGGER! CHECK IT OUT: http://rundogcat.me/2012/03/13/you-take-a-few-days-off-and/&#8221; And for as flattering as the nomination itself was, when I went to her post (which I would have done anyway because I love reading her!) her comment about me and my blog had me absolutely puddled up sitting at my desk at work. I’m still a little verklempt just thinking about it. The Second Thing actually happened before The First Thing and it took place in the single most unexpected place on planet earth for Good Things to Happen: My bathroom scale! Last Tuesday when I weighed in I had gained three pounds. Which wasn’t at all unexpected given the fact that I haven’t run in . . . awhile. Let’s just call it “awhile”. I’m tired of thinking how many days/weeks/soon-to-be-month since I last ran without pain or incident. (Although the fact that my last incident/pain-free run was a ten mile run is a nice thought. I digress . . . ) Anyway, I was prepared to have gained back some weight last Tuesday and was fully expecting the same thing yesterday. Boy was I in for a shocker! Yes, Ladies and Gentlemen, that is a FIVE in the tens column there. 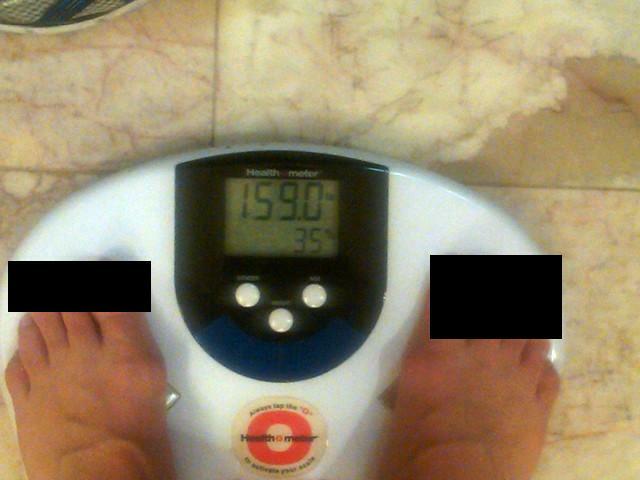 At first I doubted the veracity of my scale’s statement so I stepped off, reset it, and stepped back on. When I saw the same number twice I grabbed my phone (Because doesn’t everybody keep their cell phone handy in the bathroom when stepping on the scale? I mean, accidents happen most frequently in the home and bathroom scales have got to be responsible for a significant percentage of those. Oops, I digressed again!) and snapped a picture before Le Scale could change its mind, and that second digit! For the record: My toes aren’t horribly disfigured or even particularly camera shy. I am however a Good Southahn Girl who happens to be woefully delinquent in removing chipped polish, I am also well-versed in The Rules about such things and feel that they apply equally to posting pictures of one’s feet in any context so I placed my poor little neglected toes in the Toe Polish Protection Program for purposes of sharing the important part of the picture which is . . . The F-I-V-E in the tens column. I honestly can’t remember the last time there was a five in the tens column on a scale I was anywhere near. With or without a camera handy. 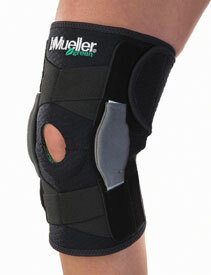 and ending two of those days pain free I decided to drop back to one of those groovy little knee bands. So far, so good. And in the interests of full disclosure – mine is black, not red. So no, that isn’t my knee. If I continue having no pain at the end of the day, I think on Saturday I’m going to get out and walk a mile or two at a good clip and see how it responds to that. 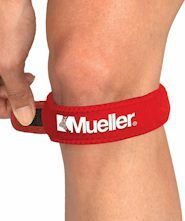 This entry was posted in blogging, injury, injury rehab, Middle-Aged Woman, Runner's Knee, Running, weight loss and tagged blogging, injury, injury rehab, Middle-Age, Runner's Knee, Running, weight loss by JFT. Bookmark the permalink. LOL! I just painted my own toes yesterday in desperation because it’s getting WARM fast and I don’t have time to go for a pedicure and I’m not putting these things in sandals without them painted! I always used to do my own but now it’s so hard to figure out which of the trifocal lenses to use to make my feet the least blurry…leading to minor polish mishaps. AWESOMEST! Yay for you on all counts! Ah ok, I was thinking maybe you cut out some callouses (which are a sense of pride amongst you runners), and wanted to spare us the carnage. I can so relate to this–similar weight, though gentle running helped me get down to that weight, and I’ve been through the injuries (ITB, runner’s knee, and plantar fascitis). Hang in there! You can get heal if you are attentive to the injuries, and middle-aged women can really run!